When a well-dressed woman steps out of a bubble and wants to know if you'd like to become a substitute princess, do you A) run; B) faint; or C) say yes? For Desi Bascomb, who's been longing for some glamour in her Idaho life, the choice is a definite C). Desi has a rare ability: with the help of "Royal Rouge," she can temporarily transform into the exact look-alike of any princess who needs her subbing services. Dream come true, right? Well, Desi soon discovers that subbing involves a lot more than wearing a tiara and waving at cameras. . . . In this winning debut, one girl's dream come true turns into the desire to make a positive impact. And an impact Desi makes, one royal fiasco at a time. Lindsey Leavitt grew up in Las Vegas and now lives in Alabama with her husband and two small daughters. Although she has been a substitute teacher and a homecoming princess, she has never been a substitute princess. Yet. 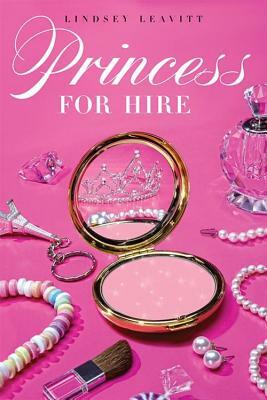 She's still scanning the Want Ads. . . . Lindsey is currently hard at work on the next book in the Princess for Hire series. Visit her online at www.lindseyleavitt.com.